The Second World War was a bafflingly complex conflict. Fittingly, this book recounts the war through multiple perspectives. Bringing together the work of nine top historians, including David Horner, Alastair Finlan, Stephen A. Hart, and Robin Havers, it offers a broad and multi-faceted composite. Through contemporary documentation, private writings, and historical research, the experiences of those who lived and died in the war—as well as the conflict’s political, military, and historical significance—unfold in a fresh narrative that offers myriad new insights. 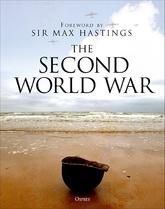 Complete with a Foreword by historian Max Hastings and superbly illustrated with color photography and maps, this volume deserves a central place on any history bookshelf.